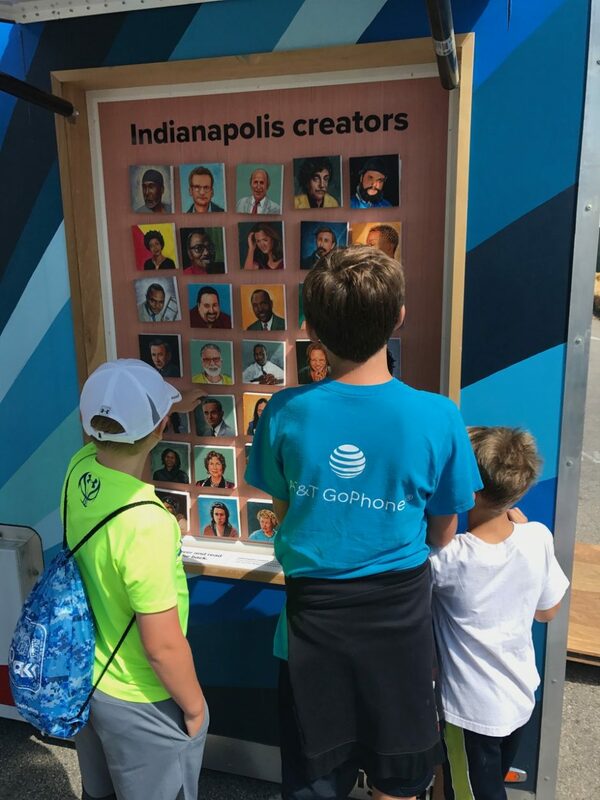 Indianapolis Creators is an interactive exhibit of hand-painted portraits displayed on the Wagon of Wonders. 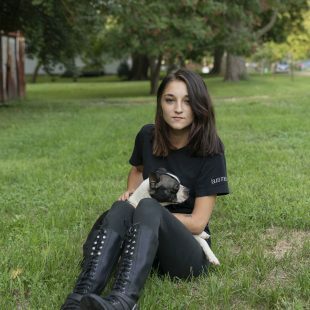 It features 35 people with Indianapolis connections who have shaped the cultural landscape of our city and beyond. These mini-paintings are attached with Velcro, so people can pull them off to read the biography on the back. 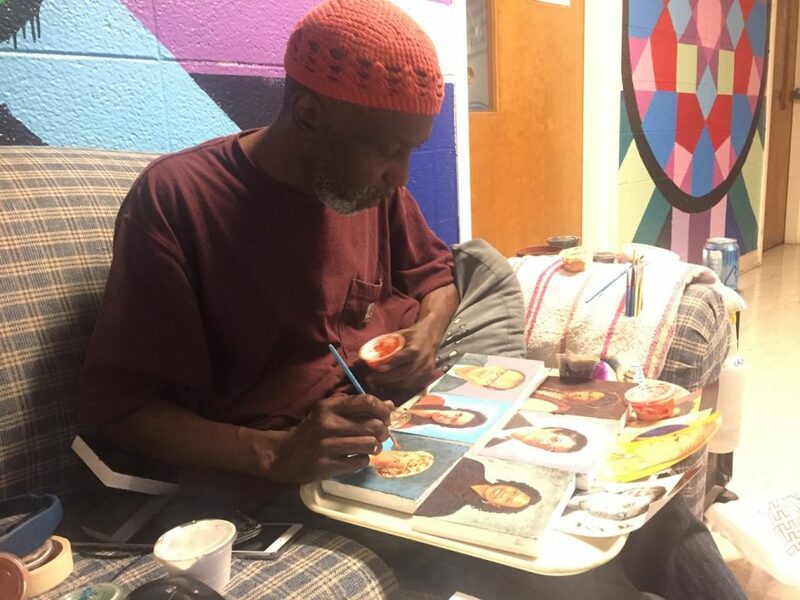 Indianapolis Creators is an ongoing collaboration between the Indianapolis painter Michael Jordan, also known as Alkemi, and Shauta Marsh, Big Car’s curator of art programming, projects, and the Tube Factory exhibition spaces. Alkemi is also the artist who created the large mural of poet Mari Evans on Mass Ave. in collaboration with Shauta. 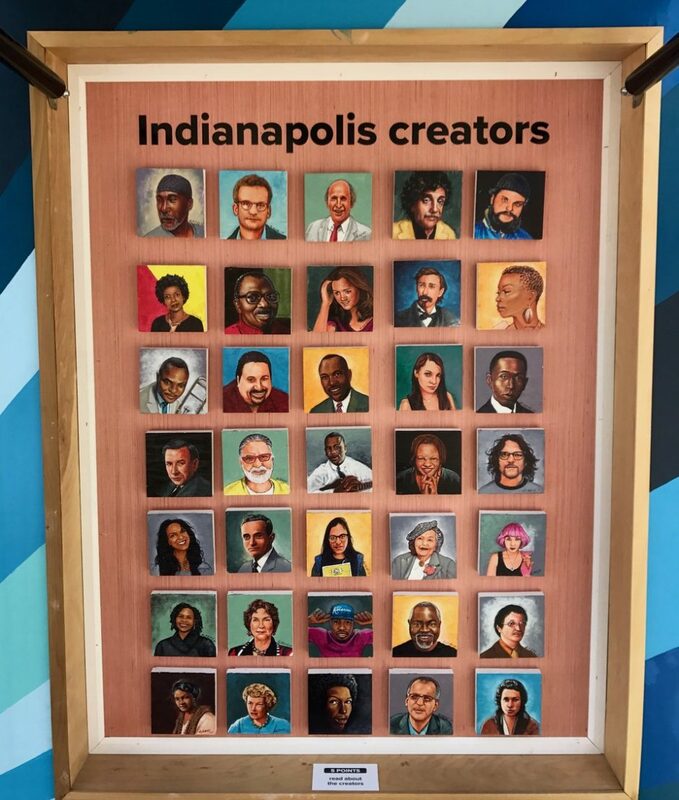 For Indianapolis Creators, Alkemi and Shauta selected the featured creative folks together, considering people who have shaped and continue to shape the creative and cultural fabric of Indianapolis. They plan to add others, rotate who is featured and potentially add a second station. Several artists included now have work on or helped create the Wagon of Wonders. 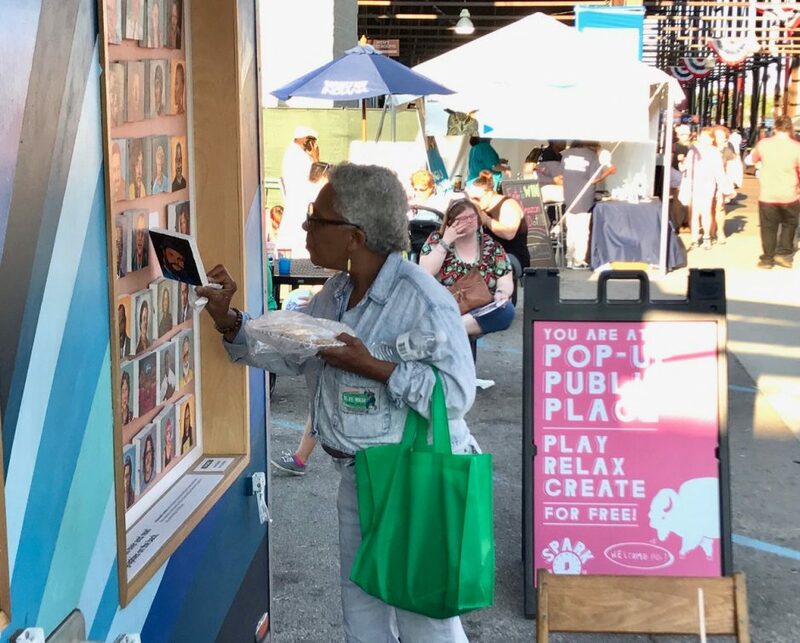 Alkemi and Shauta included them so that kids and adults interacting with the Wagon of Wonders can learn about the artists behind the different elements they experience along with the Indianapolis Creators project. 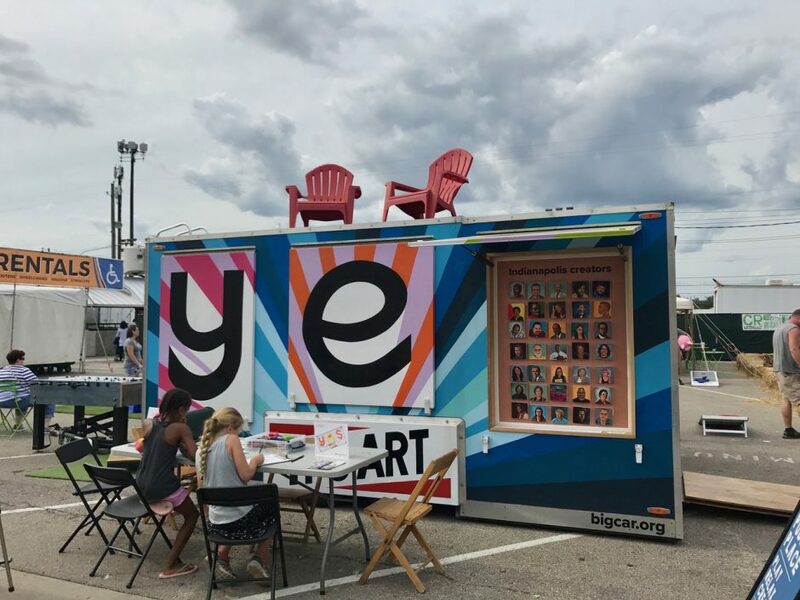 After Alkemi completed the Mari Evans mural, the Indianapolis Creators project was a great next collaboration for Alkemi and Shauta as we redeveloped one side of the Wagon of Wonders – originally a fishing bait shop and nature experience for two years in partnership with Reconnecting to Our Waterways. 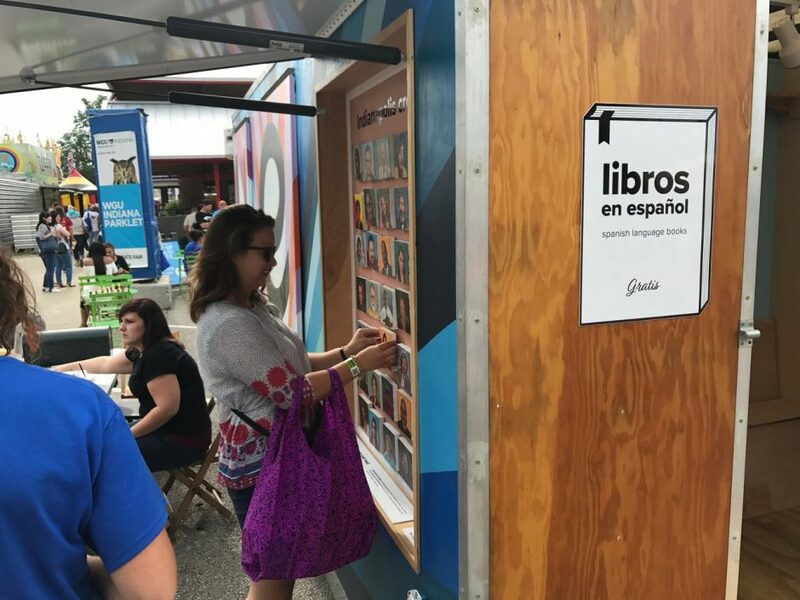 Now, that side of the Wagon is all about art and creativity and offers people of all ages and backgrounds opportunities to learn about creative people from Indianapolis. 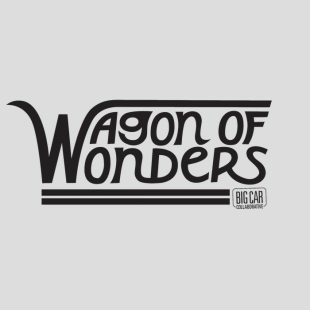 Here’s the list of people featured on the Wagon of Wonder so far (with links to more info about them): Margaret Caroline Anderson, Sasheer Zamata, Mark Battles, Vija Celmins, John Wesley Hardrick, JJ Johnson, Mab Graves, Rachel Simon, Michael Graves, Allen Whitehill Clowes, Nina Mason Pulliam, Allan Bloom, Marianne Glick, Oreo Jones, Brian Fonseca, Mozel Sanders, Beatriz, Karla Romero, John Green, Hildegarde Flanner, Kurt Vonnegut, TC Steele, Carl Pope, Booth Tarkington, Deborah Asante, Jeremy Efroymson, Etheridge Knight, Madame CJ Walker, Mari Evans, Tasha Jones, Jim Walker, Michael Jordan aka Alkemi, Wes Montgomery, LaShawnda Crowe Storm, Tom Battista.